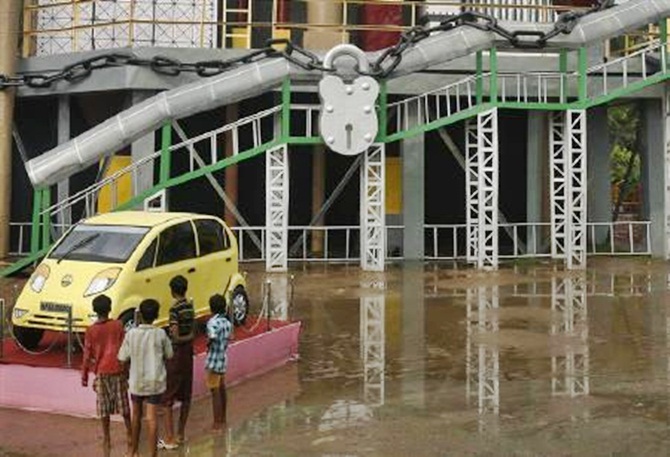 Rediff.com » Business » What if the Nano project had stayed in Bengal? What if the Nano project had stayed in Bengal? The impact on revenues and jobs may have been limited but the existence of a large, functioning factory complex from a reputed corporate group would have sent a powerful signal that the state was open for business again, says Kanika Datta. Eight years after Tata Motors' dramatic exit, the 997 acres of land that would have been a factory to produce the "people's car" remains a potent symbol of the potential and promise of West Bengal's long-awaited industrial revival. To Mamata Banerjee, energetically campaigning for a second term as chief minister now, this plot, Singur, represents a political triumph, an affirmation of the rights of unwilling land-losers over the might of the big industrialist. Others suggest it epitomises a significant opportunity lost, just when the state was beginning to shed three decades of leftist inhibitions in favour of economic reform. Would the state's industrial revival have been a reality if the Nano project -on land acquired by the state government and leased to Tata Motors on generous terms - had gone ahead in this fertile tract of land on the edge of the expanding metropolis of Kolkata? Let's begin with what the project would have meant for the state exchequer. One of the arguments in favour of the project was that it would have brought in much-needed revenue to solve a growing debt problem. This would have been doubtful, given the substantial giveaways in terms of tax breaks, soft loans and subsidies, some of them spanning 30 years, that the erstwhile Left Front government offered to attract the country's largest corporate group - concessions that then Chief Minister Narendra Modi was able to match effortlessly in prosperous Gujarat. In 2008, Sanhati, a website with the quaint stated aim to "fight neoliberalism in Bengal and beyond", scrutinised the details of the agreement between the West Bengal Industrial Development Corporation and Tata Motors and calculated that the total cost of the project to the exchequer (and, therefore, the taxpayer) as a result of these giveaways would have been Rs 3,000 crore on a net present value basis. Add in the underwhelming performance of the Nano in the market and the revenue-earning prospects from the plant, thus, would have been limited. Indeed, Banerjee's government has showed a remarkable ability to manage state finances despite the absence of this signature project. In 2011, when she took charge, debt accounted for nearly 42 per cent of gross state domestic product; by 2015, it had fallen to 35 per cent. But for then Chief Minister Buddhadeb Bhattacharya of the Left Front government, the project's revenue-earning potential was not the paramount concern; it was the employment-generating potential that mattered. Till the land was acquired by the government under the principle of Eminent Domain, 12,000 to 15,000 people drew their livelihood from this area (of which 2,200 became unwilling land-losers). Once the Nano plant came up, it was suggested, between 7,000 and 12,000 jobs would be created by the mother plant and the ancillary units (the Sanand plant, for instance, initially employed 2,400 people and there are unverified claims that some 10,000 people were dependent on the initial production). The unstated implication was that family members of the land-losers to the project could have found employment here. Like elsewhere in India, the small plot sizes meant that the second and third generation of these land-holding families were being forced to look outside the state for jobs. The Nano factory would have created opportunities for them. The latter claim is hard to substantiate, since skilled labour accounts for the bulk of the jobs in such plants, and the increasing use of robots on Indian shop floors (especially in the automotive sector) suggests that even the number of skilled jobs would have been limited. Direct job creation is one element of the employment dynamic. The auto hubs of Gurgaon, Pune and Tamil Nadu show that a large factory and its ancillaries can have a robust impact as an employment and income multiplier in the informal sector. In the absence of a credible method of measurement, it is difficult to put a firm number to this kind of employment creation, but anecdotal evidence shows that the impact can be considerable. The IT-enabled service industry, for instance, palpably created a booming demand for services such as transport, catering, health care, entertainment, even barber shops. In the year that the Singur plant was under construction, these informal services were well in evidence. In the eight years since the Tatas' departure from Singur, the state doesn't appear to have suffered appreciably. The state's economic survey says it grew 10.48 per cent in 2014-15 against a national average of 7.5 per cent. It is also true that the so-called protection of land-losers' rights has not helped the state make any great leap forward. Work had begun on the project when the Tata group withdrew, meaning that disentangling the losers' tiny holdings, where fertile soil is now mixed with concrete and other material, is well-nigh impossible. With the issue currently sub judice, most of them subsist on state compensation. The question of the "Nano effect" persists mainly because Banerjee's own high-profile efforts to attract investment have not amounted to much. According to a report by rating agency CARE, the state has actually implemented projects worth Rs 7,736 crore between 2011 and 2015, roughly contiguous to her first term. That is some distance from investment proposals of Rs 83,000 crore that Finance Minister Amit Mitra said the state had attracted over the past three and a half years. It represented the largest investment in the state after the joint venture Haldia Petrochemical plant, which came up in the nineties and has been all but paralysed by serial controversies. When Ratan Tata announced that the group would produce the world's cheapest car, the project attracted worldwide attention. Had this project, set up by India's largest corporate group with a global reputation, gone on stream smoothly, West Bengal would have got a "live" showcase for the investment community that could well have augmented Banerjee's annual investment jamborees. The Long View is an occasional series that analyses different scenarios. 5 used cars you can buy for the price of a Tata Nano! Tata gives Nano a 'twist'; will buyers go for it?